The first thing I had to do today was going to the ministry of foreign affairs in Stepanakert to obtain my visa for Nagorno Karabakh. After completing the application form and paying the money for the visa I got the sticker with stamp in my passport. So, all official stuff is done. Let’s see what we can do in Nagorno Karabakh. Since we were in Stepanakert, we brought a quick visit to the Renaissance Square with the presidential Palace and Parliament or National Assembly of Nagorno Karabakh. I didn’t know much about this city, but there was one thing I really wanted to see. A big statue of the face of an old man and woman. 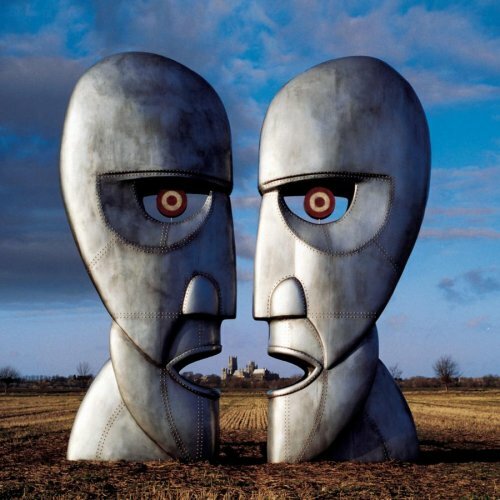 For me it somehow makes me think of the album cover of The Division Bell by Pink Floyd. Of course this has nothing to do with Pink Floyd at all. It’s in fact a very important monument for the people of Armenia. It’s called ‘We Are Our Mountains’ and represents the mountain people of Karabakh. Some people call it ‘Tatik u Papik’ which means ‘Grandma and Grandpa’. The construction works were almost finished. Let’s hope the grass quickly returns. Just south of Stepanakert, there is a town called Shushi. Due to its location on a high plateau surrounded by high natural walls and its short distance to Stepanakert it was a town of high importance during the war. Unfortunately, the city suffered badly during the war and many people left this town that once was the centre of Armenian art and culture. We visited the Ghazanchetsots Cathedral. The cathedral has seen a number of uses over the years. Before the war it functioned as church, granary and even as a garage. During the war it was a munition store for the Azeri until is was captured by Armenian forces. After the war it was reconstructed as a church and now serves as the main cathedral and headquarters of the Armenian Apostolic Church of Artsakh. The freestanding three-story bell tower of Ghazanchetsots Cathedral with its large statues of angels blowing trumpets. I highly recommend, while in Shushi, to go on the hill on the east side of the city. From there you have a stunning view into the Hunot Gorge. From here you can follow the Janapar trail – the long distance hiking route – down into the gorge to visit the beautiful Zontik waterfall. We didn’t take this path because we were a little short on time but drove with the car to the other side of the gorge from where a shorter path (start coordinates: 39.763037,46.771599) also takes you to this natural wonder. From there a path with some stunning views takes you down into to gorge and brings you in a big half hour to the waterfall. Also known as ‘Umbrella Waterfall’. The picture explains the name. Hunot Gorge. Soon after we started walking to the waterfall we saw this view. We had our pick nick at the waterfall and returned to the car. We drove back towards Stepanakert and continued driving north. Somehow I managed to lose the main road and find myself driving in a small dirt road with very small villages along the road. The main road was actually just a few hundred meters parallel to this road. We didn’t knew this until we stopped to make some photos in a village and we were invited for coffee. There, they told us we are probably on the wrong road. We were wrong indeed but we wouldn’t have met these friendly people if we would have taken the main road all the way. Our goal of the day was a little town Vank. But we made a little detour to see two castles along the road. From Stepanakert we drove to Askeran (20km) where the road goes through the Mayraberd Fortress. Another 20km finally brought us to the Shahbulag Castle. A beautiful renovated castle where we spend some time with its director while the sun was setting. He made us coffee while we had an ice cream. When it was completely dark, there was only one task left for us. We had to find a place to sleep. I knew there was a special hotel in Vank so we decided to go for it. Reaching the hotel turned out to be the biggest adventure of the day. The dirt road was full of potholes and there was only light of the car and luckily also a full moon. One and a half hour later we arrived to Hotel Eclectica in Vank. The hotel is definitely the most surreal site of Nagorno Karabakh. The photo below shows our room in this hotel. Read the journal of my fourteenth day to see how the hotel looks on the outside.